Known as Kowloon West Battery, these three gun guarded the entrance to Hong Kong's Victoria Harbour between the Stonecutters Island and Green Island from late 1800s to early 1900s. These sculptures are on permanent displays at the Sculpture walk of the Kowloon Park. The general public are free to access during park hours. The Sculpture Walk hosts the Kung Fu Corner show on every Sunday from 2:30 to 4:30pm. The Snoopy's World on the roof top of Hong Kong Sha Tin's New Town Plaza was the first Snoopy mini-theme park in Asia, first opened in 2000. It is a playground of the size of about two basketball courts featuring the famous peanut characters. In addition to the standard playground stuff, it also features Snoopy's house, "the" school bus and a mini-boat ride. There are over 50 peanut characters within the playground, it is a heaven for Charlie Brown and Snoopy's fans. Admission if free with the exception of the mini-boat ride. Kung Fu Corner is a weekly event at the Sculpture Walk of Kowloon Park. Local Chinese Kung Fu, Wu Su or martial arts, enthusiasts gathered on every Sunday from 2:30 to 4:30pm to perform in front of a live audience. Although it might sound exciting to see live combat, most of the performances are demonstrations of forms and stances. Forms and stances are important elements in Kung Fu that trains the muscle groups and reactions of the practitioners. They are performed in gradings within their own martial art organization, as well as major international competitions. There is a free mini-painting show currently being held at Runway 11 of the AsiaWorld-Expo. I was so indulged in admiring these images and forgot to note down the names of these talented local artists. The AsiaWorld-Expo is adjacent to the Hong Kong International Airport. It is one of the two major convention and exhibition facilities in Hong Kong, offering over 70,000 square meters of exhibition space with 10 column-free halls. The "Riverside Scene at Qingming Festival" is an ancient Chinese painting masterpiece painted during the Song Dynasty (AD 960 to 1279). It gave insights into urban and rural life at the Song Dynasty. Almost all civilization began on riversides; and the time that these riverside stories happened was near the Qingming Festival (around April of each year)... and hence the name "Riverside Scene at Qingming Festival". An electrical appliance that creates simple life for busy metropolitan is the microwave oven. It cooks food in minutes with no flames, no smokes and no mess. How does a such oven cook food? It works on radio wave principle. 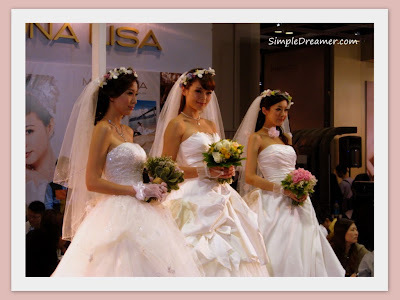 Mona Lisa Bridal Salon and France Bridal organized their own wedding dress and gown mini-shows. Models showcased beautiful dresses and evening gowns. We brought you the beautiful still images earlier, here are the video highlights. Waveguides are metallic tubes usually used in transmission of radio waves. They are a good alternative to cables as waveguides can handle more heat and energy. On the other hand, they are not as physically flexible as cables. The scientist from the fruit industry came up with another interesting application of waveguides: to determine fruit ripeness. Radio signals cannot travel thought solid metal walls. If one would like to completely block all radio signals from entering and leaving a room, one need to build all six walls with metal. This is obviously not an ideal way of construction. Is it possible to build a room that only blocks one type of radio signals but allow other types to travel through? Sure, a convenient way would be to attach Frequency Selective Surfaces to your existing walls. Parkour or le Parkour, an art that originated in France, is a philosophy of moving from one point to another as quickly and as efficiently as possible. Parkour is also referred to as free running. Ngong Ping 360 has invited French traceurs to show case Parkour from 6 to 28 November 2010. There are 3 daily shows: 11:30am, 2:00pm and 3:30pm with free lessons available after each show. Visit the Ngong Ping Village if you wish to see these muscular young gentlemen walk on and jump off Chinese roof tops. The famous Tian Tan Buddha (Big Buddha) and Po Lin Monastery are right next door to the Ngong Ping Village. It's November 2010. Froyo (aka Frozen Yougurt, Android OS 2.2) was released several months ago and Gingerbread (which is likely to be Android 2.3) will soon be available for user trial. Let's have a look at how the Android manufacturers are doing in terms of their support in Android OS versions. The price that we'd normally refer to when comparing Smartphones is the RRP (recommended retail price). Retail shops might offer a further 3% to 5% discount occasionally. Carriers (mobile network operators) usually offer discount to customers for committing to a one or two year contract. Depending on the mobile service plan, customers might be able to get the phone for "free". Carriers sometimes claim that these handsets are heavily subsidized, are they? How much does a Smartphone really cost your carrier or retail channels? A special exhibition Marvellous Inventions of Leonardo da Vinci is currently being held at the Hong Kong Science Museum. 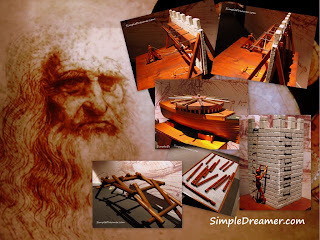 The Exhibition features crafted models built by The Artisans of Florence that brought some of da Vinci's designs to life. The show runs from 8 Oct 2010 to 9 Feb 2011. We were there to capture some of these ingenious inventions for you. SIM locks are implemented by manufacturers upon mobile network operator's requests. SIM prevents mobile handsets usually subsided by an operator to be used on other networks. SIM lock can be applied to any mobile equipment that operates with a SIM card. These devices include mobile phones, wireless terminals such us USB modems, wifi-routers, wireless gateways and wireless tablets. The television and radio broadcasts that we have enjoyed in the past century were analogue broadcasts. In recent years, television and radio stations can finally launch digital broadcasts services. The benefits to the broadcasters include better use of the radio spectrum, better signal, voice, picture quality, more channels available and the option to include value-add features. Equipment vendor can sell digital set-top boxes, digital television sets, home and car radios. Governments can also take this opportunity to reuse and plan parts of the radio spectrum. What's in it for the general public? Metropolitan might have discovered that cellphone reception at 40 to 50 stories above ground level is generally poor. This is not surprising. Cellphone reception at street level is usually better as most cell-site antennas beam downwards. It makes perfect technical and business sense as majority of customers make phone calls and use mobile internet when they are stationed at level 5 or below. We are in a Smartphone era. As discussed previously, the form factor of most cellphones has converged to slant. Cellphones became a slab, a rectangular box with a big flat screen. The keypads have disappeared and so have the Call and End Call Buttons. Do you still remember the days when you could press the Call button to review the recent call list? Do you still remember the days when you could press the End Call button to terminate any tasks; held the End Call button to switch off your phone? These days were over. The physical keys have been replaced by virtual keys. The two keys sometimes even merged into one key (that toggles) on some mobile phones! Nowadays, most smartphones and tablet devices come with a touchscreen. There are broadly two types of touchscreens: capacitive and resistive. Choosing a device with the right screen type can make a world of difference, as the user experience is impacted by the response from the device when a user touches the screen. The question is, which type is better? The answer is clear. Have a look around and see what the top manufacturers have chosen. The launcher, the main user interface of an Android device, contribute significantly to the user experience. While the Android OS comes with a default Google launcher, most manufacturers have developed their own launcher to offer the best experience to their customers. Let's have a look at the special features of the various launchers available. There is yet another mini-plant show at the Kowloon Park. The various variety of plants are presented in an artistic way. Wouldn't it be nice if we have some of these in our backyards? Kowloon Park hosts a series of temporary mini-shows and displays throughout the year. It is also the home of exotic birds and plants, a small natural heaven in the city.